The Governor's Cup Race first took place in 1997 with the trophy donated by then Governor His Excellency David Mackilligan. Spike, owned by Brian Nixon and skippered by Sam Talbot won the 2017 Governor's Cup Race on Saturday, retaining their title from 2016. 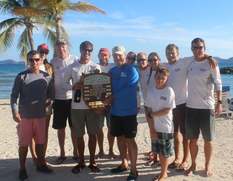 Seven boats contested the race on a brilliant BVI race day over a 17 mile course starting at Nanny Cay, rounding Little Thatch to port, rounding the eastern most Rhone anchor dive buoy in Peter Islands' Great Harbour to port and returning to the finish off Nanny Cay.